Background: We aimed to determine the contribution of four DFNB loci and mutation analysis of gap junction beta-2 (GJB2) and GJB4 genes in autosomal recessive nonsyndromic hearing loss (ARNSHL) in South of Iran. Materials and Methods: A total of 36 large ARNSHL pedigrees with at least two affected subjects were enrolled in the current study. The GJB2 and GJB4 genes mutations were screened using direct sequencing method. The GJB2 and GJB4 negative families were analyzed for the linkage to DFNB21, DFNB24, DFNB29, and DFNB42 loci by genotyping the corresponding STR markers using polymerase chain reaction-PAGE method. Results: We found a homozygous nonsense mutation W77X and a homozygous missense mutation C169W in 5.55% of studied families in GJB2 and GJB4 genes, respectively. Five heterozygous mutations including V63G, A78T, and R127H in GJB2 gene, and R103C and R227W in GJB4 gene were detected. We identified two novel variations V63G in GJB2 and R227W in GJB4. 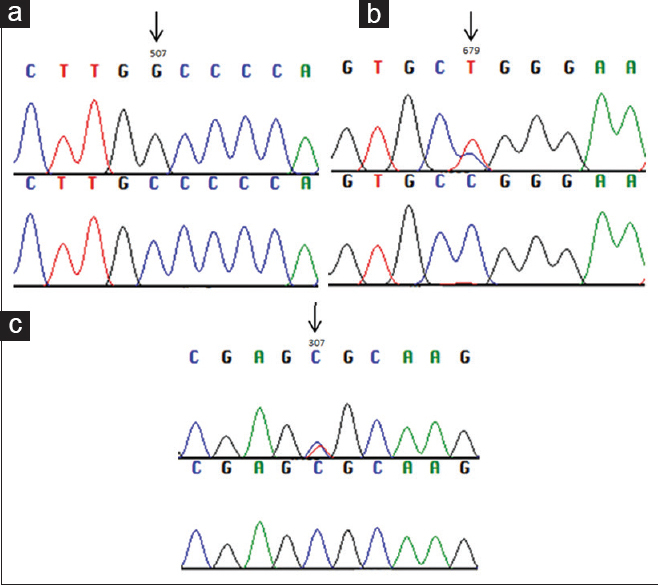 In silico analysis predicted that both novel variations are deleterious mutations. We did not unveil any linkage between DFNB21, DFNB24, DFNB29, and DFNB42 loci and ARNSHL among studied families. Conclusion: This is the first report of GJB2 and GJB4 mutations from Hormozgan population. According to the previous publications regarding GJB2 and GJB4 mutations, the distribution of the mutations is different from other parts of Iran that should be considered in primary health-care programs. Further investigations are needed to evaluate the contribution of other loci in ARNSHL subjects in South of Iran. Congenital hearing loss (HL) is considered as a most prevalent sensorineural disorder associated with both genetic and environmental factors that affect 1–2 in 1000 neonates worldwide. In Iran, the incidence of HL has been estimated one case in 166 live births. This high frequency of HL, at least in part, steams from high consanguineous marriage rate (38.6%) in Iranian population. In the last decades, myriad investigations have been carried out to disclose etiopathogenesis of HL that revolutionized our knowledge concerning molecular basis of this disorder. However, owing to high genetic heterogeneity and multiple phenocopies of HL, more studies in this area are needed. Genetic causes account for approximately 50% of HL and can be inherited as either syndromic (~30%) or nonsyndromic (~70%) types with a spectrum of inheritance patterns. Autosomal recessive nonsyndromic HL (ARNSHL) is the common hereditary type of HL that has been causally linked to mutations in over eighty different loci nominated as DFNB loci. Among various loci, DFNB1 (gap junction beta-2 [GJB2] gene, MIM 121011) has been identified as a master switch. GJB2 gene encodes connexin 26 protein that its mutations are responsible for nearly half of ARNSHL cases in many populations. Since the initial reports of the identification of GJB2 gene mutations in ARNSHL, more than 100 variants have been identified throughout the gene. With regard to ethnicity, the contribution of GJB2 gene mutations in ARNSHL ranges from 22% (at Northwest) to <5% (at South) in Iranian cases; however, considering the total number of ARNSHL patients, 4.17% of them carry a single heterozygous mutation of GJB2 gene., Therefore, the GJB2 gene mutations only explain a fraction of ARNSHL and the reported rates illustrated the possible role of other loci in Iranian cases. Studies in Western countries illustrate GJB6 gene to be involved in ARNSHL as a common second mutated allele; however, regarding the investigations about GJB6 gene in Iranian cases, it does not seem that this gene highly contributes to the pathogenesis of ARNSHL as a second allele., As the encoding gene for connexin 30.3, GJB4 has been investigated in the recent studies including a study in Iran by Kooshavar et al. in 2013 that indicates its possible role as a second mutated gene in digenic inheritance of ARNSHL. 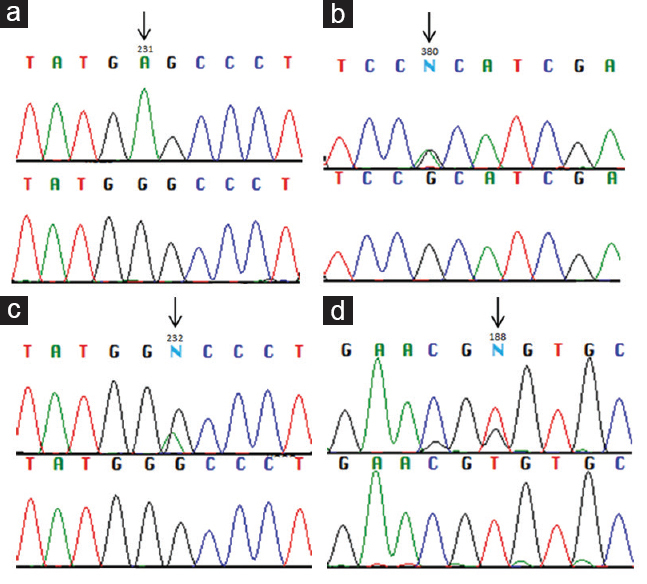 This study reveals several missense (c.451C>A/Wt; c.507C>G/Wt; c.542C>T/Wt), frameshift (c.155_158delTCTG/Wt), and silent (c.219C>T/Wt) heterozygote variations in GJB4 gene of which the missense c.542C>T variation seems to have a pathogenic role since it was detected only among patients but not in control individuals. Thus, GJB4 stands as a potential candidate gene in patients with compound heterozygote inheritance pattern that provokes us to investigate it among our population. There are evidences to support an association between DFNB21 (TECTA, MIM 602,574), DFNB24 (Radixin (RDX), MIM 179,410), DFNB29 (claudin 14 [CLDN14], MIM) and DFNB42 (ILDR1, MIM 609,739) loci, and ARNSHL. The autosomal recessive locus DFNB21 is characterized by prelingual, severe HL phenotype that harbors TECTA gene. TECTA encodes a major noncollagenous component of the tectorial and otolithic membranes called alpha tectorin, and its mutations lead to disruption of sound transmission to the stereocilia.RDX is mapped on chromosome 11q23, designated DFNB24. It is believed that RDX functions as cross-linkers between plasma membranes and actin filaments.CLDN14 gene, located on DFNB 29 (chromosome 21q22.13), encodes a tight junction protein which has been implicated in the inner ear ion homeostasis. Mutations in CLND14 disrupt ionic permeability of the paracellular barrier of the reticular lamina and lead to the death of hair cells, ultimately. The ILDR1 gene which encodes immunoglobulin-like domain containing receptor 1, maps to chromosome 3q13.33while the precise function of ILDR1 is unknown, a possible role in epithelial barrier functions is postulated. To the author's knowledge, there is no data available for the association of DFNB21, DFNB24, DFNB29, and DFNB42 loci with ARNSHL in South of Iran. To illuminate the link between these loci and ARNSHL, which will be useful in genetic counseling for such families, contribute to reduce the incidence of HL and decrease socioeconomic burden, we aimed to analyze GJB2 and GJB4 genes mutations and evaluate the contribution of these loci in ARNSHL families in Southern Iran. A total of 36 large ARNSHL pedigrees with at least two affected subjects were included in this descriptive study from Hormozgan province of Iran. HL screening for members of the families was performed by pure tone audiometric test, enabling determination of the degree, type and configuration of a HL and clinical examination, with special emphasis on recognizing potential environmental causes of hearing impairment such as infections, trauma, and information on exposure to known or possible ototoxic drugs or evidence of syndromic forms of deafness. HL informational questionnaires were obtained from all members of families, and the pedigrees were drawn based on the filled-out questionnaires and interview with families by genetic counselors. Based on their pedigree, 36 families (167 individuals) were finally screened as ARNSHL. This study was approved by the Institutional Review Board and Ethics Committee. All Participants signed an informed written consent form, and filled-out demographic characteristics form before enrollment. Genomic DNA was extracted from EDTA-containing peripheral blood of all members of the families using commercial kit (Genet Bio, South Korea) according to the manufacturer's instructions. The quality and quantity of extracted DNA were confirmed by agarose gel electrophoresis and NanoDrop ® ND-1000 spectrophotometer (Thermo Scientific, USA), respectively. All affected subjects were screened for mutations in exon 2 of the GJB2 gene using direct sequencing technique. To amplify the exon 2 of the GJB2 gene, the primers F: 5'-CGTCTTTTCCAGAGCAAACCG-3' and R: 5'-AGCTCCATTGTGGCATCTGG-3' were used in the polymerase chain reaction (PCR) procedure. PCR thermal conditions were as follows initial denaturation at 95°C for 2 min, 35 cycles of denaturation at 94°C for 30 s, annealing at 59°C for 30 s, extension at 72°C for 30 s, and final extension at 72°C for 5 min. The amplified fragments of GJB2 gene (809 bp in length) were detected on 1% agarose gel. Subsequently, the PCR-amplified products were bidirectionally sequenced using Sanger sequencing (Macrogen, South Korea). Negative and heterozygous samples for GJB2 gene mutations were tested for GJB4. PCR was performed to amplify the entire coding sequence of GJB4 with F primer: 5' TCAATCGCACCAGCATTAAG 3' and R primer: 5' GGGGGA CCTGTTGATCTTATC 3'. PCR thermal conditions were as follows initial denaturation at 95°C for 2 min, 35 cycles of denaturation at 94°C for 30 s, annealing at 60°C for 30 s, extension at 72°C for 30 s, final extension at 72°C for 5 min. Finally, the PCR products were separated by electrophoresis procedure on 1% agarose gel. DNA sequencing of the PCR-amplified products was carried out directionally (Macrogen, South Korea), using the same primer. GJB2 and GJB4 Sequencing data were analyzed with CLC genomic workbench 4 software and compared with the published sequences of Human Genome Database and GenBank (GJB2: NG_008358.1; GJB4: NG_016243.1). Negative samples for GJB2 gene mutations were tested for linkage analysis of DFNB21, DFNB24, DFNB29, and DFNB42 loci using STR markers which are shown in [Table 1]. Based on STRs physical distance in NCBI Map Viewer and NCBI UniSTS, we selected the STRs and their primers. A panel of 15 different STR markers was genotyped for DFNB21, DFNB24, DFNB29, and DFNB42 loci, according to the selection criteria including greater heterozygosity values, shorter amplicon, and locating near the known locus. The PCR solutions contained 100 ng genomic DNA, 10X PCR buffer, 10 pmol of each primers, 10 nmol of each deoxyribonucleotide triphosphates, 1.5 mmolMgCl2 and 1 U Taq polymerase in a final volume of 25 μl. A two-step touchdown thermal cycling was designed for each STR markers based on the Tm of both primers. PCR was started with an initial denaturation step 94°C for 5 min was followed by 7 cycles of denaturation (94°C, 15 s), annealing (60°C, 40 s) and extension annealing (72°C, 40 s) followed by a final 25 cycles of denaturation (96°C, 40 s), annealing (58°C, 40 s), and extension (72°C, 40 s) and final extension at 72°C for 10 min. Finally, the PCR products were separated by electrophoresis procedure on 10% polyacrylamide gels stained by silver nitrate. Out of 36 families (167 people) who enrolled in this study, 72 individuals had ARNSHL (43.11%). Twenty out of 36 studied families had consanguineous marriage (55.55%). Hearing is measured in decibels (dBs). The threshold for each frequency (0-dB) indicates the level at which a normal young adult hears a tone burst 50% of the time. It is considered normal hearing if an individual's thresholds are within 25 dB of normal thresholds. The subjects divided into mild (26–40 dB), moderate (41–60 dB), severe (61–80 dB), and profound (≥80 dB) hearing impairment according to World Health Organization classification of HL. The frequencies of the moderate, severe, and profound HL among affected subjects were 11.11% (n = 8), 58.33% (n = 42), and 30.55% (n = 22), respectively. After comparing sequencing data with published (UCSC Genome Browser) sequences, we revealed a homozygous nonsense mutation W77X (231 G>A) and a homozygous missense mutation C169W (507 C>T) in 2/36 (5.55%) of studied families in the coding sequence of GJB2 and GJB4 genes, respectively. Furthermore, DNA screenings identified other three allelic variants in GJB2 gene in 7/72 (9.72%) of subjects [Table 2]. 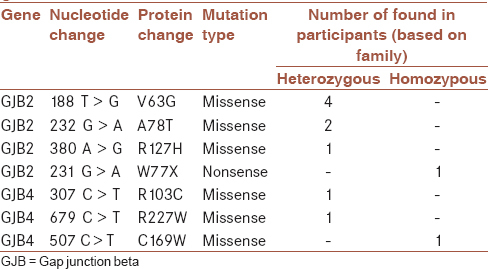 Out of the 7 patients, 4 for V63G (188T>G), 2 for A78T (232 G>A), and 1 for R127H (380 A>G) were heterozygote in coding region of GJB2 gene [Table 2] and [Figure 1]. Moreover, we found two additional heterozygous variants including R103C (307 C>T) and R227W (679 C>T) in the coding region of GJB4 gene in 2/72 (2.78%) of patients [Table 2] and [Figure 2]. No evidence of digenic inheritance mode was observed between GJB2 and the GJB4 mutations in patients who carried heterozygous mutations. Among the detected variation, two variation including c.188T>G in GJB2 and c.679 C>T in GJB4 genes have not been previously reported. To predict the putative effects of amino acid substitutions at codon positions 63 and 227 on the structure and function of Cx26 and Cx30.3 proteins, respectively, we used PolyPhen-2 online software (http://genetics.bwh.harvard.edu/pph2/index.shtml). The substitution of valine by glycine at codon 63 of Cx26 and arginine by tryptophan at codon 227 of Cx30.3 were predicted to be deleterious. (sensitivity: 0.00; specificity: 1.00). We failed to identify linkage of the DFNB21, DFNB24, DFNB29, and DFNB42 loci among thirty-six GJB2 negative families. If at least three STR markers (fully informative) of a DFNB locus did not show homozygosity among the affected individuals of a family, then the locus would be determined unlinked. All members of GJB2 negative families, including parents, deaf, and healthy siblings were heterozygous for all studied STR markers. Owing to high genetic heterogeneity in ARNSHL, designing a general efficient genetic test for diagnosis of the precise molecular basis and genetic counseling is complicated. It becomes more and more complicated because the type and frequency of pathogenic mutations are notably dependent on either ethnic or geographic origins of the populations. The best approaches to overcome these obstacles are the identifying common pathogenic mutations and determining significantly associated loci in ARNSHL patients for carrier screening. Hence, we designed this study to screen GJB2 and GJB4 mutations and to evaluate the contribution of the DFNB21, DFNB24, DFNB29, and DFNB42 loci in ARNSHL families in Southern Iran. Analysis of the coding sequence of the GJB2 gene was revealed four different allelic variants including W77X (231 G>A), V63G (188T>G), A78T (232 G>A), and R127H (380 A>G) in subjects. The pathogenic role of W77X (231 G>A), A78T (232 G>A), and R127H (380 A>G) GJB2 mutations was previously described in various papulations , while V63G (188T>G) novel sequence variation was not reported. The W77X (231 G>A) homozygous mutation was found in one subject of studied family. This nonsense mutation occurs at the transmembrane region of Cx26, associated with moderate-to-severe HL and have been reported commonly in Indian and Pakistani families ,, the A78T (232 G>A) mutation which occurs in the second transmembrane domain of Cx26 was rarely detected in Indonesian and Chinese subjects. The pathogenic role of R127H (380 A>G) is controversial, and several investigations have concluded that R127H most likely represents a polymorphism. A novel V63G (188T>G) sequence variation was predicted as a deleterious mutation using PolyPhen software. The mutated residue lies in the first extracellular loop of Cx26 which serves as the key docking site to hemichannels at the extracellular medium. According to the previous studies, it has been demonstrated that mutations in lining residue of this domain lead to disruption of voltage properties of gap junction pore. We detected a homozygous missense mutation C169W (507 C>T) in coding region of GJB4 in one patient with severe HL phenotype. This mutation results in a substitution of cysteine to tryptophan at codon 169 of Cx30.3 protein within the second extracellular loop domain which play a fundamental role in docking of gap junction hemichannels. The C169W mutation has previously been reported in Taiwanese and Iranian families., In addition, the sequencing of GJB4 revealed two allelic variants R103C (307 C>T) and R227W (679 C>T) variants. The association of the first variant with ARNSHL have previously been founded. In silico analysis, demonstrated that the second variation, R227W (679 C>T), is a deleterious mutation. We did not unveil any linkage of the DFNB21, DFNB24, DFNB29, and DFNB42 loci among GJB2 and GJB4 negative families. In accordance with our findings, Sadeghi et al. were not found evidence of linkage for DFNB21 locus in ARNSHL patients in Markazi and Qom provinces of Iran. However, several investigations have reported different frequencies of DFNB21 mutations (2.7%–6.6%) in various ethnics of Iran. Data from the previous studies have been indicated that mutations in RDX gene (DFNB24) are less common in ARNSHL cases of Middle Eastern countries such as Iran, India, and Pakistan. These data are in harmony with our results. Although the mutations of CLDN14 gene (DFNB29) were identified in Pakistani and Grecian subjects with ARNSHL, it seems that its mutations are not linked to profound deafness in Iran, Tunisia, and Turkey. Up to now, more than fifteen different mutations have been detected in Pakistani, Saudi Arabian, and Czech as well as in Iranian populations.,, However, we failed to find linkage of the DFNB42 locus among studied families. In this study, we observed seven mutations in the coding region of GJB2 and GJB4 genes that three of them (W77X, A78T, and R127H) in GJB2 and two mutations (R103C and C169W) in GJB4 have been reported worldwide. We also found two novel allelic variations including V63G (188T>G) and R227W (679 C>T) in coding region of GJB2 and GJB4 genes, respectively. In silico analysis predicted that both novel variations are deleterious mutation. In contrast to several publications from Iran, we did not unveil any linkage of the studied loci among GJB2 and GJB4 negative families. Observed disagreement between the reports, highlights the diversity of the Iranian population and the fact that the contribution of other loci should be investigated in South of Iran. Authors would like to express sincerest appreciation to all individuals who participated in this study. The authors are thankful of Hormozgan deaf people society, welfare organization of Bandar Abbas for their great help in this project. We are grateful of deputy of research and technology, Hormozgan University of Medical Sciences, Bandar Abbas, Iran, for financial support of this study. Mikstiene V, Jakaitiene A, Byckova J, Gradauskiene E, Preiksaitiene E, Burnyte B, et al. The high frequency of GJB2 gene mutation c.313_326del14 suggests its possible origin in ancestors of Lithuanian population. BMC Genet 2016;17:45. Mahdieh N, Rabbani B, Wiley S, Akbari MT, Zeinali S. Genetic causes of nonsyndromic hearing loss in Iran in comparison with other populations. J Hum Genet 2010;55:639-48. Rafiee L, Saadat M. Prevalence of consanguineous marriages among Iranian Georgians. J Biosoc Sci 2011;43:47-50. Friedman TB, Sellers JR, Avraham KB. Unconventional myosins and the genetics of hearing loss. Am J Med Genet 1999;89:147-57. Mahdieh N, Mahmoudi H, Ahmadzadeh S, Bakhtiyari S. GJB2 mutations in deaf population of Ilam (Western Iran): A different pattern of mutation distribution. Eur Arch Otorhinolaryngol 2016;273:1161-5. Kooshavar D, Tabatabaiefar MA, Farrokhi E, Abolhasani M, Noori-Daloii MR, Hashemzadeh-Chaleshtori M. Digenic inheritance in autosomal recessive non-syndromic hearing loss cases carrying GJB2 heterozygote mutations: Assessment of GJB4, GJA1, and GJC3. Int J Pediatr Otorhinolaryngol 2013;77:189-93. Esmaeili M, Bonyadi M, Nejadkazem M. Common mutation analysis of GJB2 and GJB6 genes in affected families with autosomal recessive non-syndromic hearing loss from Iran: Simultaneous detection of two common mutations (35delG/del (GJB6-D13S1830)) in the DFNB1-related deafness. Int J Pediatr Otorhinolaryngol 2007;71:869-73. Noori-Daloii MR. Mutation Analysis of GJB2 and GJB6 Genes and the Genetic Linkage Analysis of Five Common DFNB Loci in the Iranian Families with Autosomal Recessive Non-Syndromic Hearing Loss. J Sci IR Iran 2010;21:105-12. Najmabadi H, Kahrizi K. Genetics of non-syndromic hearing loss in the Middle East. Int J Pediatr Otorhinolaryngol 2014;78:2026-36. Meyer NC, Alasti F, Nishimura CJ, Imanirad P, Kahrizi K, Riazalhosseini Y, et al. Identification of three novel TECTA mutations in Iranian families with autosomal recessive nonsyndromic hearing impairment at the DFNB21 locus. Am J Med Genet A 2007;143:1623-9. Shearer AE, Hildebrand MS, Bromhead CJ, Kahrizi K, Webster JA, Azadeh B, et al. A novel splice site mutation in the RDX gene causes DFNB24 hearing loss in an Iranian family. Am J Med Genet A 2009;149:555-8. Bashir ZE, Latief N, Belyantseva IA, Iqbal F, Riazuddin SA, Khan SN, et al. Phenotypic variability of CLDN14 mutations causing DFNB29 hearing loss in the Pakistani population. J Hum Genet 2013;58:102-8. Mathers C, Smith A, Concha M: Global burden of hearing loss in the year 2000. Global Burden of Disease. 2000, Geneva: World Health Organization. p. 1-30. Modell B, Darr A. Science and society: Genetic counselling and customary consanguineous marriage. Nat Rev Genet 2002;3:225-9. Ramzan K, Al-Owain M, Allam R, Berhan A, Abuharb G, Taibah K, et al. Homozygosity mapping identifies a novel GIPC3 mutation causing congenital nonsyndromic hearing loss in a Saudi family. Gene 2013;521:195-9. Salman M, Bashir R, Imtiaz A, Maqsood A, Mujtaba G, Iqbal M, et al. Mutations of GJB2 encoding connexin 26 contribute to non-syndromic moderate and severe hearing loss in Pakistan. Eur Arch Otorhinolaryngol 2015;272:2071-5. Santos RL, Wajid M, Pham TL, Hussan J, Ali G, Ahmad W, et al. Low prevalence of Connexin 26 (GJB2) variants in Pakistani families with autosomal recessive non-syndromic hearing impairment. Clin Genet 2005;67:61-8. Tsukada K, Nishio SY, Hattori M, Usami S. Ethnic-specific spectrum of GJB2 and SLC26A4 mutations: Their origin and a literature review. Ann Otol Rhinol Laryngol 2015;124 Suppl 1:61S-76S. Huang A, Yuan Y, Duan N, Jiang X, Wang B, Liu Y, et al. Hearing loss associated with an unusual mutation combination in the gap junction beta 2 (GJB2) gene in a Chinese family. Int J Pediatr Otorhinolaryngol 2014;78:599-603. Matos TD, Simões-Teixeira H, Caria H, Rosa H, O'Neill A, Fialho G. The controversial p. Arg127His mutation in GJB2: Report on three Portuguese hearing loss family cases. Genet Test Mol Biomarkers 2010;14:141-4. Oshima A, Tani K, Toloue MM, Hiroaki Y, Smock A, Inukai S, et al. Asymmetric configurations and N-terminal rearrangements in connexin26 gap junction channels. J Mol Biol 2011;405:724-35. Skerrett IM, Aronowitz J, Shin JH, Cymes G, Kasperek E, Cao FL, et al. Identification of amino acid residues lining the pore of a gap junction channel. J Cell Biol 2002;159:349-60. Wu CC, Lin YH, Lu YC, Chen PJ, Yang WS, Hsu CJ, et al. Application of massively parallel sequencing to genetic diagnosis in multiplex families with idiopathic sensorineural hearing impairment. PLoS One 2013;8:e57369. Alikhani RH, Ostaresh F, Babanejad M, Bazazzadegan N, Najmabadi H, Kahrizi K. Investigating seven recently identified genes in 100 Iranian families with autosomal recessive non-syndromic hearing loss. Iran Rehabil J 2015;13:63-7. Yang JJ, Huang SH, Chou KH, Liao PJ, Su CC, Li SY. Identification of mutations in members of the connexin gene family as a cause of nonsyndromic deafness in Taiwan. Audiol Neurootol 2007;12:198-208. López-Bigas N, Melchionda S, Gasparini P, Borragán A, Arbonés ML, Estivill X. A common frameshift mutation and other variants in GJB4 (connexin 30.3): Analysis of hearing impairment families. Hum Mutat 2002;19:458. Sadeghi A, Sanati MH, Alasti F, Hashemzadeh Chaleshtori M, Mahmoudian S, Ataei M. Contribution of GJB2 mutations and four common DFNB loci in autosomal recessive non-syndromic hearing impairment in Markazi and Qom provinces of Iran. Iran J Biotechnol 2009;7:108-11. Masoudi M, Ahangari N, Poursadegh Zonouzi AA, Poursadegh Zonouzi A, Nejatizadeh A. Genetic linkage analysis of DFNB3, DFNB9 and DFNB21 loci in GJB2 negative families with autosomal recessive non-syndromic hearing loss. Iran J Public Health 2016;45:680-7. Ullah S, Aslamkhan M, Rasheed A. Molecular distribution of deafness loci in various ethnic groups of the Punjab, Pakistan. J Coll Physicians Surg Pak 2015;25:573-8. Marková S, Brožková DŠ , Mészárosová A, Neupauerová J, Groh D, Křečková G, et al. Mutations in eight small DFNB genes are not a frequent cause of non-syndromic hereditary hearing loss in Czech patients. Int J Pediatr Otorhinolaryngol 2016;86:27-33. Mehrjoo Z, Babanejad M, Kahrizi K, Najmabadi H. Two novel mutations in ILDR1 gene cause autosomal recessive nonsyndromic hearing loss in consanguineous Iranian families. J Genet 2015;94:483-7. Ramzan K, Taibah K, Tahir AI, Al-Tassan N, Berhan A, Khater AM, et al. ILDR1: Novel mutation and a rare cause of congenital deafness in the Saudi Arabian population. Eur J Med Genet 2014;57:253-8.